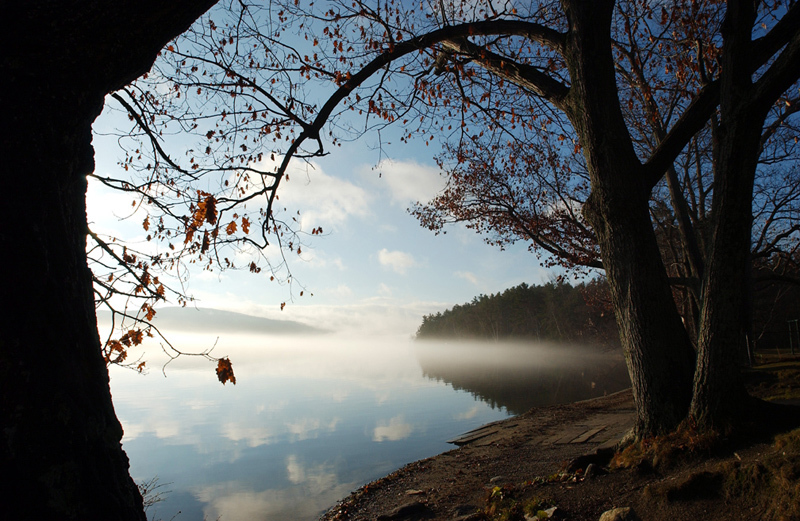 The lake known as Stockbridge Bowl is the property of the Commonwealth of Massachusetts and is defined as a Great Pond. Although the lake belongs to the State, the Town of Stockbridge is responsible for its maintenance, including its problems. The Stockbridge Bowl Association works closely with the Town to insure the health and safety of the lake. The Town of Stockbridge owns approximately 2,875 feet of shoreline around Stockbridge Bowl: 300 feet at the boat ramp, 1,125 feet at Gould Meadows, 450 feet at the Town Beach, and an estimated 1,000 feet from the dam to the diversion drain at the Outlet. Stockbridge Bowl was first known as Lake Mahkeenac, a name given by the local Mahican Indians, a tribe of the Mohicans. Mahkeenac means “home of the Mahekanus.” For a brief period of time it was called Mountain Mirror, according to a map at the Stockbridge Library Archives. Stockbridge Bowl is 372 acres in size. From its north shore to the Outlet at the south end, it is about 1. miles long, about . miles wide at its widest point, and has approximately 6 miles of shoreline. The maximum depth is 48 feet; average depth is approximately 27 feet. A sampling of lake water revealed 13 species of fish: largemouth bass, chain pickerel, yellow perch, bluegill, pumpkinseed, yellow bullhead, black crappie, rock bass, golden shiner, white sucker, rainbow trout, brown trout, and lake salmon. The trout and salmon are the result of annual spring and fall stockings. Fishing on the lake is very popular, including in the winter when ice fishermen set up huts on the lake. Public boat access to the lake is provided by a double concrete ramp with a 40-car parking lot on the northwestern shore. The ramp was installed by the Berkshire County Commissioners in the 1950’s and is now controlled by the Commonwealth. Swimming at the ramp area is not permitted. The canoe/kayak part of the Josh Billings race is launched from here. There are three additional ways to access the lake on foot. At the south-east shoreline, the Stockbridge Town Beach provides a sandy beach, life guards, changing and rest rooms, picnic tables, and playground equipment. Areas open to the public are Gould Meadows, owned by the Town of Stockbridge, and Bullard Woods, owned and managed by the Stockbridge Bowl Association. Both have walking trails to the lake. Bullard Woods also provides picnic tables and a boat-landing ramp. In addition, there is a connector walking trail made available by the Boston Symphony Orchestra between Gould Meadows and Bullard Woods. There are more than 400 homes around the Bowl. Many are along the lake front, while others are tucked into the hills, mainly behind the east and south sides of the lake. There are five lake homeowners’ associations. On the east shoreline there is Mahkeenac Shores, north of that is Mahkeenac Terrace, and Mahkeenac Heights, which is above the lake. Near the Town Beach, there is the largest cluster of homes in an area called Beachwood, some along the lake and some hidden in the woods to the south of the lake. Lake Drive is located on the west shore of the Outlet. There is a causeway near the northeast shore. On the other side of the causeway is Lily Brook Pond, which is the holding pond for the lake. Years ago, one could paddle a canoe under the causeway and into the pond, but, unfortunately, it is now impassible due to the build up of silt, beaver dams and weeds. North of the causeway is the condominium community of White Pines. To the west of White Pines on the north shore of the lake is Camp Mah-Kee-Nac, founded in l926 by Joe Kruger, a boy’s camp from the end of June to mid-August. From 2002 to 2007 during the last week of August, Camp Mah-Kee-Nac renamed itself for one week and became America’s Camp— a seven-day camp for boys and girls who are the children of 9/11. The young people who came here are the children of policemen, firemen, municipal workers, and stewardesses who lost their lives in the 9/ll tragedy. The first year there were 70 children. In 2007, America’s Camp moved to Camp Danbee in nearby Hinsdale because the number of children increased to 350 and Camp Mah-Kee-Nac could not contain them all. Adjacent to the camp is Bullard Woods. In l961, this land was given to the SBA by Mrs. William Norton Bullard, one of the original SBA members, and is open to the public. The Woods are managed by the SBA which has created and maintained a hiking trail that starts at Hawthorne Road and wends its way to the shoreline. There is now a bridge that fords a stream in the woods, and the public is invited to walk through the woods, across the Tanglewood connector and on to Gould Meadows, exiting on Route 183. The lakefront property of the Kripalu Center for Yoga and Health abuts Gould Meadows. The Kripalu site was originally Shadowbrook, one of the loveliest and largest of the Berkshire “cottages.” When it was built in1893 by Anson Phelps Stokes, it was the largest home in America. Later it was sold to Andrew Carnegie, who was in residence here at the time of his death. During World War II, when Carnegie could not return to his beloved Scotland, he came here to Shadowbrook because the rolling landscape reminded him of home. The old stone boathouse on the lake was the Shadowbrook beach house. Shadowbrook burned to the ground in March of l956. At the time, it was owned by the Catholic Church as a Jesuit training seminary. After the fire, the church built the brick structure that we see today. Due to a decline in the Jesuit order, the building was closed and left vacant for 13 years. Kripalu Center for Yoga and Health purchased the property in l983 and recently added an extension. Kripalu is the largest residential yoga and wellness center in the U.S. Above Kripalu is the large white house called Seranak, owned by the Boston Symphony Orchestra. It was the summer home of Serge Koussevitzky, the founder of Tanglewood, who, for many years, was the conductor of the Boston Symphony. The name Ser-a-nak stands for Serge and Natasha Koussevitzky. Natasha was Koussevitzky’s first wife. When she died, he married her niece Olga, who had been Natasha’s secretary. After Koussevitzky’s death, Madame Olga continued to spend her summers here. Two other Berkshire “cottages” near the lake are Wheatleigh, built in 1893 by Henry Harvey Cook and inherited by his daughter Georgie upon her marriage to the Count Carlos Manuel de Heredia, and Elm Court, built in 1886. Elm Court was the residence of William Douglas Sloan and Emily Vanderbilt Sloan. Continuing south on the west side of the lake past the boat ramp is the Mahkeenac Boating Club. This private club with a very active membership was founded in the 1890’s. Toward the south end of the lake there is a two acre island known simply as The Island. Owned and maintained by the SBA, it attracts blue herons, green herons, osprey, loons, cormorants, Canada geese, bald eagles, as well as many ducks. Behind the Island one of the lake’s problems is very visible—the infestation of the beautiful but unfortunately invasive water lilies. Continuing south past the Island is the Outlet, a narrow weed-infested waterway that leads to the dam and the lake overflow that empties into Larrywaug Brook and ultimately into the Housatonic River.